Fun Finds For the Week! I know many of you have heard of Switch Flops. I read about them quite a while ago but they are even more fun than I thought. You buy the shoe and add the strap. 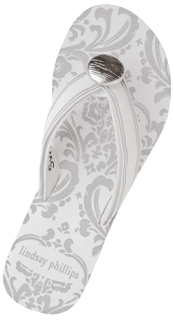 The interchangeable design is by Lindsay Phillips who holds the patent for this wonderful shoe. 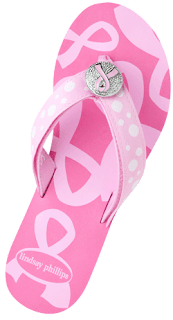 This month the Breast Cancer Awareness shoe was introduced. See what it looks like to change to another strap. 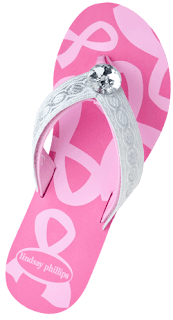 You still have the Pink Ribbon for awareness with a little bling added! ...and with a little flower flair. 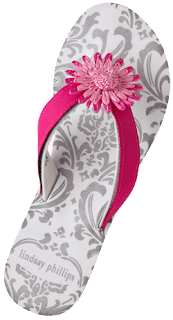 ...add that same flower flair and voila and new shoe! 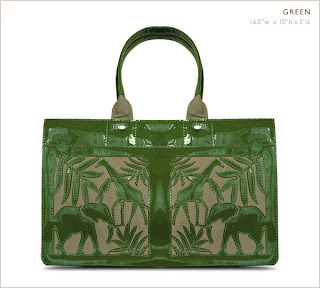 The bags shown below are totally cruelty free from the San Francisco company Noah Handbags (The name Noah is a play on 'no animals harmed'). The bags were shown in O magazine and are wonderful. The design below is a computer bag. 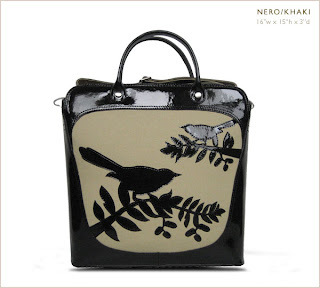 What a great and fashionable way to carry around your laptop or netbook! The materials for the bags are high quality Italian PVC over canvas. These bags all have three interior pockets for cell phone, ipod and all your gadgets! 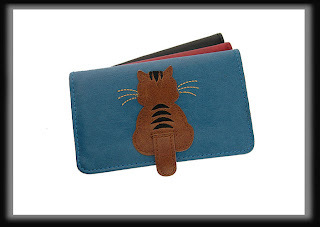 The Toronto based company Lavishy sells vegan totes, messenger bags and small coin purses and wallets. 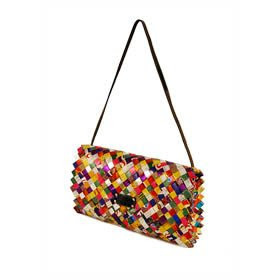 Wonderful accessories to put in the bags above or the bags they sell as well. They feature about six collections a year. 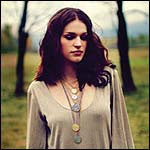 I love their accessories and check out their jewelry too! 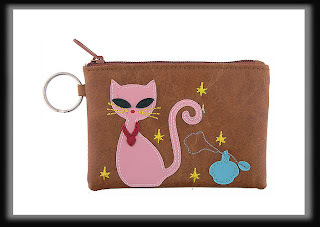 and of course the retro kitty is tres chic. 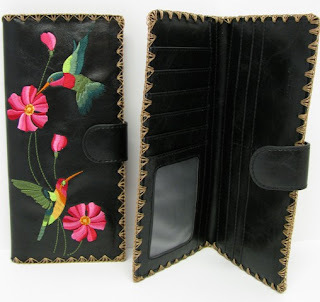 just a couple of their wallets that have credit card slots and lots of compartments! The colors and all bright and fun. You can even smile when you spend your money. well.... look what the company nauh ollin came up with. Well thanks for checking in this week. I have more fun finds to come!! Next update Saturday Sept 5th. See you then! When the Accessories Magazine arrives each season with the Fashion Trends Issue I keep them in file and compare to what trends are hot for that year. Sometimes the predictions are months or even a year before you actually see people wearing them on the West Coast. This is a great guide to keep in your own fashion file! The website shopjuici.com has fantastic headbands! 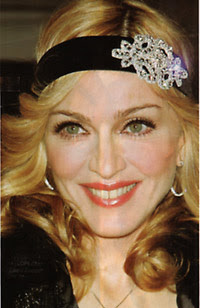 The design shown on Madonna is one of their exclusives. Looks like a great list! Let me know some of your favorites for the season! I attended the San Francisco Gift Fair looking to see what was new this year. I heard the show was smaller than previous years so I did not know what to expect. I was so excited when I discovered some really fantastic gems!! 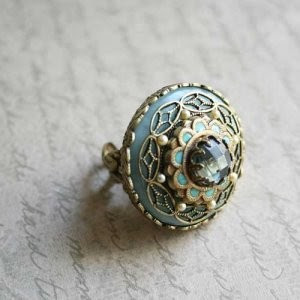 These rings are sensational! The company is called ollipop and is actually a division of Sweet Romance. 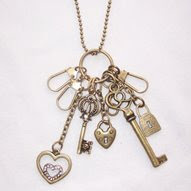 Sweet Romance is a vintage inspired jewelry company with designs by Shelley Cooper who also designs the ollipop division! ollipop is described as the pop art of personal style. Semi-precious stones, old glass elements blended together with unique retro metals. Unfortunately there is no website at this time for ollipop. 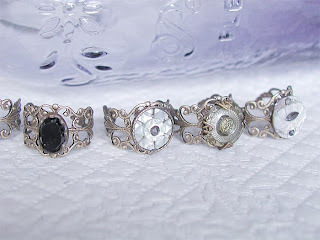 The rings are selling so quickly they are unable to fill orders fast enough. If you are having trouble finding the products. Please feel free to email me at thetrendguru@gmail.com with any questions or if you are interested in any of the rings. One of the obvious trends is green products. Well let's hope this is a new way of life and not a trend! 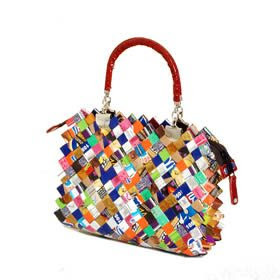 There were companies that used recycled materials in the most creative way. Among them were recycled clothing, office and school supplies, shopping bags and the jewelry company shown below Squishy Sushi. What a great name for a business! 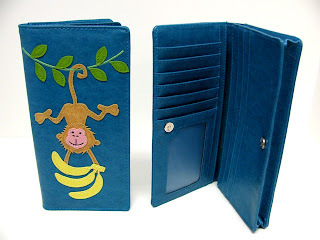 All designs are one of a kind since the materials are recycled. 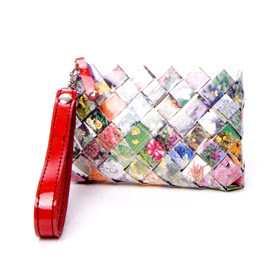 This bracelet is made from recycled Japanese chiyogami paper. 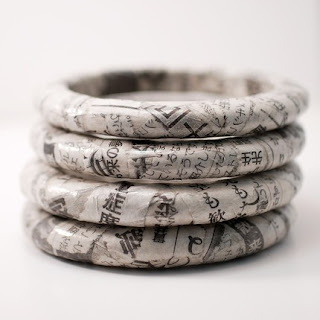 The next bracelet is made from recycled Japanese newspapers! 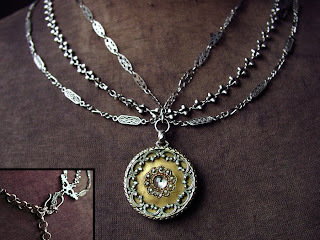 This necklace pendant is made from an old recycled domino tile. 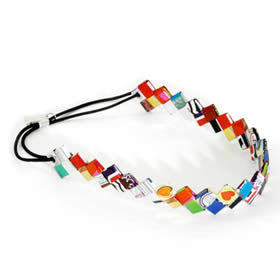 This beautiful necklace is made from a old recycled scrabble tile! The last company is a company called My Mothers Buttons. This is a wonderful use of truly beautiful pieces of art. 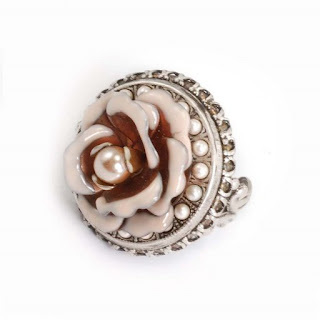 The company uses antique buttons for their incredible jewelry creations. 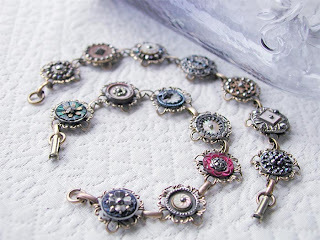 The button bracelets pictured below have an assortment of different color and textured buttons. All of the pieces are one of a kind . 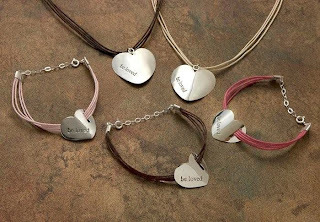 There are also bracelets that are all the same button or same color theme. They are all treasures! Here are some of the ring designs and once again they are all unique pieces. I can see that any of these pieces could be the start of a collection! If you have any questions or are interested in the products feel free to email me at thetrendguru@gmail.com! Fun Charms and Accessories with a Positive Message! 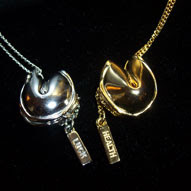 This wonderful Fortune Cookie Necklace is from a company called "Bee Charming". 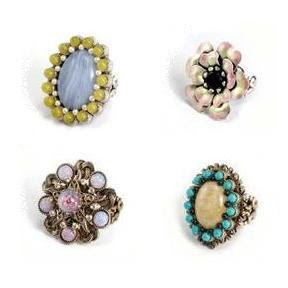 They are a New York company and have quality costume jewelry at affordable prices. Very fun and trend oriented pieces. This necklace is a sure conversation starter and is available with the following tags: fame, happiness, health, love, luck and wealth. The next group is from another favorite company of mine Be.ology. 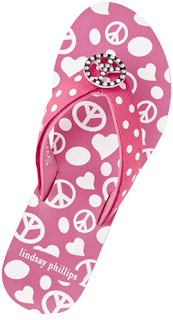 They feature products with postive thoughts and messages. Why not make your energy positive, meaningful, and even helpful? The scarves from Be.ology have the wonderful messages printed on them. 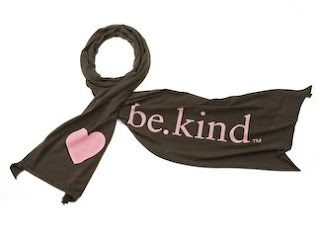 Some of the sayings on the their products include, be.kind, be.exceptional, be.inspired and be.peaceful to name a few. Check them out at http://www.beologyonline.com/. 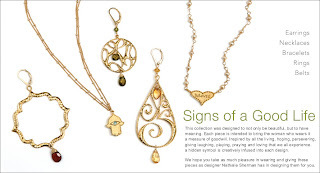 Sophia and Chloe jewelry have really unique an stylish collections. 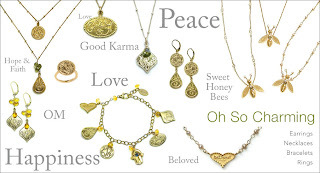 The first collection is called "Signs of a Good Life" Many good karma pieces! 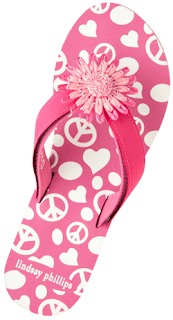 As you see I can't get enough of the products that are not only fun and funky but have lots of dangles and charms and love the positive messages! Change your accessories and change the way you feel and your mood. Keep up the fun and Keep accessorizing! If you have any questions or problems locating these items feel free to email me!